On days like this, I like to see what is in the green. Often those names will be the leadership stocks during the next leg up and/or hold up the best during a downdraft. Or of course there could be a specific catalyst, as we are seeing today in the gaming stocks - specifically Wynn Resorts (WYNN) and Las Vegas Sands (LVS). The driver is an astounding 42% year over year growth (and 19% month over month!) in Macau gambling revenue as there seems to be no stopping this gambling mecca. Gambling revenue in Macau rose 42% in May from a year earlier, government statistics issued Wednesday show, as the opening of a massive new casino resort last month helped revenue rise to a record high for the fourth month in a row. Gambling revenue in Macau, the only place in China where casinos are legal, has been growing at a blistering pace since the end of 2009 as mainland Chinese visitors continue to place bets despite local government policies to slow the booming industry and encourage a more measured pace of growth. Macau overtook the Las Vegas Strip as the world's biggest gambling market in 2006 and last year raked in about four times the Strip's gambling revenue. 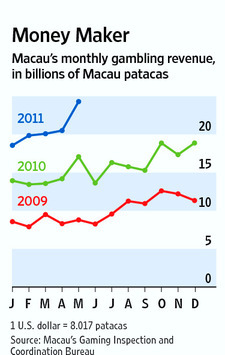 Analysts expect Macau's gambling revenue to grow to five times the size of the Strip's this year. Gambling revenue in the Chinese territory rose to 24.31 billion patacas ($3 billion) last month, up from 17.08 billion patacas a year earlier, according to data from Macau's Gaming Inspection and Coordination Bureau. The May figure was 19% more than the last monthly record of 20.51 billion patacas set in April. 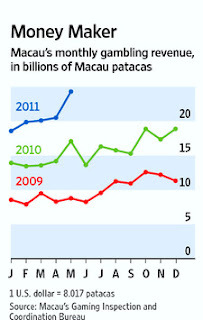 In the year to May 31, Macau's gambling revenue was up 43%, following a 58% surge for the whole of last year. Following the data, RBS analyst Philip Tulk said he will need to raise his current forecast for Macau's gambling revenue to grow 28% in 2011. CLSA analyst Huei Suen Ng noted Macau's May revenue alone was equal to almost half the house's $6.5 billion forecast for the Las Vegas Strip's gambling revenue for 2011. Macau's May revenue was at the high end of a May 26 forecast from Bank of America Merrill Lynch for gambling revenue to hit between 23 billion patacas and 24 billion patacas last month. Analyst Billy Ng said the strong growth was partly due to the May 15 opening of Galaxy Entertainment Group's Ltd.'s new casino resort in Macau's Cotai area. "We see Galaxy Macau driving traffic and injecting new VIP liquidity, with growth in both mass (market) and VIP for the rest of 2011," Mr. Ng wrote.